3rd Avenue, a block or so below 42nd Street. 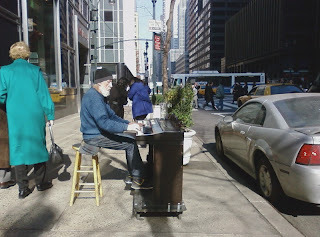 I've decided that a guy with a piano on wheels is exactly what I need to make my day nicer. Hmm....Mr. Snob plays and we have a wonderful piano that does actually have wee little wheels to move it about the house. ....I think he needs to go mobile.